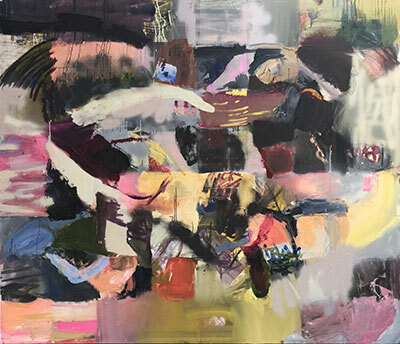 Josh Highter is an artist whose work focuses on the intersection between observation and memory, utilizing the processes of drawing, painting, and printmaking. The spaces constructed play at the tension between the familiar, observed experiences and the foreign, distant memories that are what remain of these experiences once they are over. 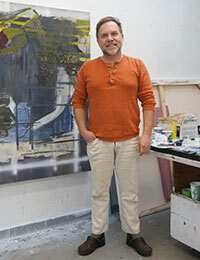 His paintings are process driven and the surface of the painting is of primary interest. As a teacher, I encourage personal investigation, invention, and experimentation and challenge my students to find the broader abstractions and themes in their observations. I work with my students so they gain the confidence and knowledge to start their own process of artistic production, address the essential formal and expressive issues in their work, and develop their perceptual and conceptual skills. As the son of a cabinet builder, I carry the values of craftsmanship and competence learned in my youth into my own art production and into my classroom. I start with the basics, and make sure that my students learn and are comfortable with the fundamentals of art, while at the same time taking care to encourage students to look for broader concepts that inform their work and self-expression. Often my class will start with very structured lesson plans that deal with a particular formal issue. In the beginning of my Drawing I class, for example, my students use a viewfinder to organize the two-dimensional picture plane in order to understand the concepts of composition, scale, and proportion. This is a basic technique, but an important one that I know my students will use as they develop artistically. In my Drawing II and III classes, I have my students move on from these fundamental skills to looking at ideas of movement and broader abstractions of light, mass, and scale and proportion. To explore these concepts, one project I often have my students do is a drawing where they rotate around the still life subject for the duration of a class period. This allows a surface to build upon the drawing before they can work on the specifics of the subject matter. I see the processes of art, from start to finish, as something very personal and I think it’s important to challenge students to critically assess the way that they create art. For example, I often have my students bring in observational sketchbook drawings; I then have them cut apart these drawings and use them to create collages of self-portraits, master studies, and reinvented landscapes and interiors. I do this so they can open themselves up to new ways of seeing, new ways of working with materials, and new ways of forming images. At every step, I encourage them to question why they work with one medium or in one manner and push them to think about seeing and creating art in a new way. As my classes develop, and my students gain technical skills and a vocabulary to talk about their work, we discuss larger contemporary art concerns and I challenge them to question how and why we create art. I expect my students to use the skills they gain in my classroom so they can become active members in the contemporary art world. I think this process begins with group critiques. These group critiques push my students to take the analytical skills and vocabulary that they learn in the classroom and use them while assessing their peers’ work as well as their own work. This self-assessment is a crucial element in their growth as artists and helps them to evolve and adjust their ideas. I often find that critiques give students a clearer idea of what they want their art to do and say. My students learn the importance of communicating clearly, gain confidence, and develop a vocabulary specific to visual communication, as well as reflect on their own reasons for making art. I love teaching my students how to think creatively. While I often challenge my students, I also want them to have fun and realize how exciting it can be to create something new. For example, recently I had my students explore the difference between perceptual and pictorial space by taking a fairly simple still life of a water glass and having them create a grid, they then painted from the grid as opposed to the glass itself, thus creating an abstraction of the image. 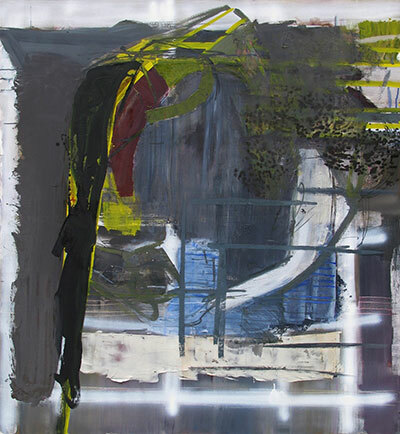 This project reinforced the concept that all painting is abstraction, and made students receptive to the idea of experimenting more in their paintings and their process. As a teacher I want to share my experiences and knowledge, and create an environment that is comfortable for discovery and growth. The on-going refinement of my curriculum revolves around my personal experiences, my research, and an on-going dialogue with my colleagues and students. “Piles of Stuff” are things I have been tripping over in my own home, things that have been accumulating, things that for good or bad I have to deal with. These piles are manmade and formed by loved ones, they are landmarks formed by extreme forces of nature, they are permanent, and they are fragile. In this current body of work and in prior works, I have been interested in the exploration of the simple opposition of chaos and order. The work is exploratory both in the act of looking for subject matter and in depiction and definition of what the subject matter is. There is a paradox in the work, in the desire to preserve a sense of the familiar while also embracing the idea that memories are constructed and in many ways alien from the original experience. These simultaneous desires have led me to question the pictorial representation of subject matter within the work. Painting is all about the process—I have a deep love of my materials and the physicality of paint. I enjoy working with and trying to combine different methods and applications of paint within one surface, this is in essence the accumulation of time and space. Elements in these paintings are not in the same space. The paint surface and the pictorial incidents are in a constant state of transformation affected by daily observations and interactions. Forms are left to float in space, straight lines zig-zag and curve, parts speed up, others slide slowly by, patterns are left un-connected to forms. Time and space is not linear. Within the mark-making, hard edges exist, showing clear divisions of shapes and delineations of space. 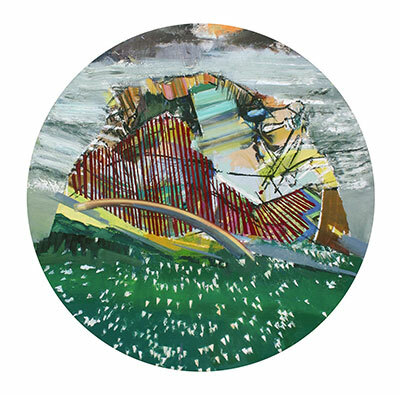 I utilize ideas of collage to combine multiple sources of information into one image and as a way of organizing and structuring my paint surface. Recently, I have been painting on large sheets of plastic and using these as a way to print repetitive patterned images into the painting. Symmetrical, random, and intentional marks mesh together to build a new space, a pattern with a history that builds upon itself. Through the process of layering and overlaps, illusions of paint, and a heavy-handed construction, a new world is emerging. 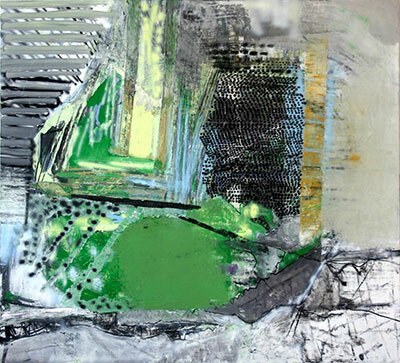 Ideas of chance and organic development are critical elements in my paintings. Paintings and my studio practice in general become a place for experimentation, investigation, and invention. A place where I can both observe the structured development of composition and the organic development of paint surface. I consider my paintings landscapes, even though they are devoid of a recognizable image. I am interested in the tension between experience and memory, the familiar and the alien. These types of spaces are adventurous and my intention is to present a space that is new to explore and a bit of a challenge to navigate, in essence taking the viewer on a hike through a new wilderness.